As you are reading this - I am at a meditation retreat up north and I have been in complete silence for 6 days. Oh how I love my life and my amazing assistant who keeps things rolling. Thank you Dan! My life is getting better and better all of the time, and it feels great to acknowledge this. Does this mean I no longer have struggles or challenges? No, it doesn't. What I do have is a daily spiritual practice that gives me peace, clarity, and strength; it helps me to be present and accept life on life's terms; and it keeps me on a path of gratitude, love, and self-discovery. I have come along way. Years ago, a teacher told me in a very direct way that my inner world was a direct reflection of my outer world. I didn't like hearing this AT ALL - because my outer world was a complete disaster. And if this was true it meant I had to get real, be accountable and start making some changes, rather than be on the run and constantly blaming everything and everyone for everything. Well...He was right. When I am focused on being of service it is a great day. And when I am caught up in self-centered thinking or forgetting about others there is little gratitude or joy to be found. How I start my morning is key. When I wake up, I take time to meditate and pray, and lately, I have been saying positive affirmations out loud - which I find is changing my thinking and how I feel in my body. Trust. Feel safe. Surrender to the moment. Feel gratitude. Still my mind and open my heart. There is nothing greater than to be in the moment and feel this fullness of life within me and see it in people and everything around me. And it is such a huge contrast from the lens I used to view myself and my world. When I go through challenging times it becomes even more important for me to connect inward and use the tools I have to get through whatever has been presented to me. I am SO incredibly grateful for this! I also have mentors who guide me and people in my life who love and support me. This journey isn't meant to be walked alone. The Key: You just have to get started. Choose 1 simple thing to do every day and then build on that. 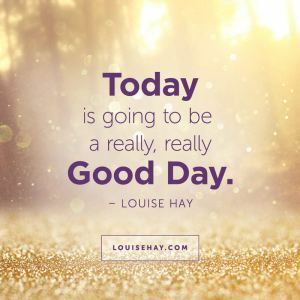 Maybe it could as simple as saying...."Today is going to be a really, really good day!" Newer Post Mindful Monday: It's back to school! As children we learn. As adults we unlearn. Older PostMindful Monday: I am leaving for a 10 day silent retreat. Yes - complete silence!